I'm Gabor GyĂ¶rgyi from Hungary. I started bicycletouring few months after my parents bought a bicycle for me in the year 1991. 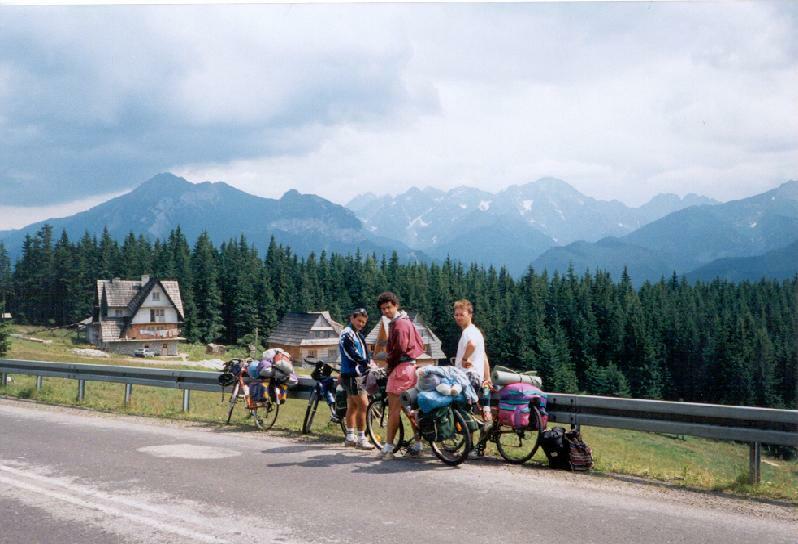 After the first 2 years I got enough experience during my summer bicycle tours (5) in Slovakia and Tatras mountain ranges between 1993 and 1999. 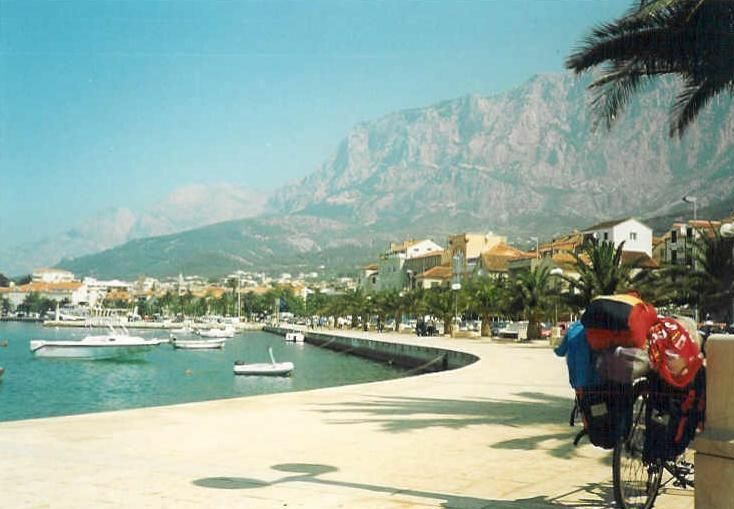 After discovering / visiting Slovenia, East-Austria and the croatian Adriatic coast in the last decade I spend my summer bicycle tours in high mountains: Alps, Pyrenees, Canary islands (1999) ad Andalucia (2012). After being amazed by the legendary ascents of the Tour de France or Giro d'Italia my goal was to reach all of the summits, cols, peaks of the Alps, Pyrenees and Canary islands situated above 2000 m and can reached on paved roads (look at the map). I finished this project, and edited and uploaded dozens of videos about that. To reach a place by bike gives much more different feelings, experiences then travelling by car or train. It is a great feeling, when in the morning I look out from the tent and I see the humid air, the mountains, the first sunlights, and the dewdrops on the grass or the plants, and during / after the breakfast to see the planned route for that day on the map. Bicycletouring keeps the body in good condition, but besides I think it is good for the peoples soul / spirit and develops the will-power. My opinion is that it gives a character to the bikers: for me every bicycletourer is a reliable people. The times how much I needed to climb a few passes can be found in the site on the left side. I started the tour with a great and ideal cycling challenge I found few months earlier and then the following days were days like normal bicycle touring days. The Monte Grappa chellenge is a cycling challenge within a day when You can decide how many times do you want to cycle different ascents of the legendary climb, Monte Grappa (1750 m). The maximum was 5 climbs before midnight, I chose 4 that meant 225 km-re 6591 m. After the finish I felt me well so I added ca. 2 hours of cycling and finished the day with 261 kms + 7241 m heightdifference. The 1st ascent was wonderful but brutal with the 20% steep sections. After a rest day I went on with my bicycle tour. The 1st climb was one of the most wonderful ones of the tour: Penegal (1737 m) next to Bolzano. It offered beautiful view to the Dolomites and a lake down + the wild rockwall of the Penegal and the road ascending on its side. After visiting Passo MOrtirolo and Crocette Val Bighera I went on pedalling to Switzerland. Few years before I climbed Passo Bernina (2330 m), but from North. THis time I ascended its south side which is few hour long climb. The following day I returned to Albulapass after 11 years and then visited a hardly known, short, but steep ascent to Hotel Salastrains. Julierpass was short too. I finished the day after midnigh and after climbing Steinigboda (2049 m). I had to do that day, beause I had no other days left. The following day was a totally rainy day, when I climbed BĂ¤rgli (2137 m) - it offered not much view but I had the 1st cycling video about it. In the North side of the Alps my following day was too variable and rainy so I had to battle with the heavy headwind and rain while I were cycling up to Oberalppass (2042 m). My last climb was Passo Scimfuss (2242 m) - that can be reached from Passo Gottardo and the view shows Nufenenpass, the serpentines of Passo San Gottardo, down the town Airolo and the valley to Biasca. That was a great place as the last high point of the tour. After more than 20.000 kms in the Alps and 2 bicycle tours in the PyrĂ©nĂ©es I wanted to cycle the highest heightdifference on a paved road in Europe: from sealevel to the end of the paved road going to Pico Veleta (3394 m). Of course I made it harder with that I carried my 27 kgs weighted panniers, because I'm a real bicycletourer. ... I spent 12 days in Andalucia. In the first days I cycled along the Costa de Sol and in the afternoons I visied two panoramic climbs and a day before turning North to Granada and then Pico Veleta I climbed a very hot (like Hell) mountainside: Sierra de LUjar. Reaching the saddle I could see the Sierra Nevada, and Pico Veleta (3394 m) I started the following day before 8 am and cycled to Granada and started the climb to Pico Veleta (2700m hieghtdiff.) in the afternoon. I enjoyed is very much made much videofilm, but reached the end of the paved road after 11 pm. - in darkness. After a rest day with my touring partner (who arrived meantime) cycled back to Pico Veleta in sunshine. Above 2500 m we had to face very serious wind, gale. At a time as TamĂˇs was walking next to his bike on the dirt road the wnd lifted up his bike !!! From the peak we could see not only the Costa del Sol, but Gibraltar too !!! After the fact that in 2010 I cycled on the paved missing climb of the PyrenĂ©es finishing above 2000m, in 2011 I had a serious plan: to cycle, visit the missing paved ascents in the Alps to finish my collection of the climbs finishing above 2000m. I missed more than 30 ascents. In May I visited 6 climbs in South Tirol and Tirol, than it was followed by this tour, in my favourite region, part of the Alps: the French Alps. The bicycle tour contained well known ascents, few of my favourites, like La Bonette (2802 m) for the 5th times, or Galibier (2645 m) and Col de l'Iseran (2770 m), another favourite of mine, but besides - of course - there were climbs about that I could found minimum information on the internet. Such climbs were for example Parking du Laus (2110 m) by Lac Allos, or a wonderful climb, Plan du Lac (2362 m) or Plan d'Aval: about these climbs I could infirm the cyclists by this travelogue or by the description that I published by quaeldich.de. I often had rain, more than during my previous tours in the French Alps, but I was so motivated, that the rans couldn't stop me. I visited all of the planned climbs above 2000m. Fortunately in the day of the most memorable climbs I had beautiful weather. On my "king's stage" I visited 4 climbs finishing above 2000m and cycled 162 km + 3890 m. ON the following day - after 6 hours sleeping I cycled up to Courchevel and ascended up sometimes in rain up to the 2188m high Col du Petit St Bernard to be able to catch my airplane in a day time. Courchevel was my 186th occasion that I bicycled above 2000m and the place with I reached that I cycled all of the paved ascents of France that ends above 2000m. After I uploaded my videos to my youtube collection, my collection is the only one, that has all of the bicycling videos of all of the paved french climbs above 2000 m.
After 15 years bicycling in Europe, in the Alps, PyrenĂ©es and Canary islands in 2010 I felt enough confidence to pake part in the Ă–tztaler bicyclemarathon (228 km + 5500 m heightdifference). THis is said to be the hardest classical and famous (not extreme) bicyclemarathon in Europe. It has 4 climbs, 3 of them are above 2000m and the last one is the hardest: ca. 1800m heightdifference with few kms with 10% steepness. It's like the hardest stage of the Tour de France or Giro d'Italia. In the previous years few Tour de France cyclists took part in it, like Claudio Chiapucci or Gerrit Glomser, and in 2011 Jan Ullrich. This has been one of my dream for several years. I enjoyed the day very much, as one of my most memorable day of my life. It was a cold day and there was risk for raining. AFter entering Italy the weather felt warmer and I could enjoy cycling more than in Austria. I rode my touringbike and cycled and lived the day as a cyclourer: stopped for photos, sometimes during cycling, but sometimes by a stop I recorded video about the event. Totalyl I recorded 50 minutes long film / movie. I needed enough energy by Brennerpass, so I didn't have too much time on Jaufenpass, but I could reach the limitpoint at time, and after it the ascent of Passo Rombo / Timmelsjoch (2509 m) was bicycling with joy in every minute. That was fantastic! I took a lot of pictures and memorable video. After enering Austria, I was descending towards the finish, when I started to cry for few seconds: it was so emotional, to do: I would finish and I would fulfill one of my dream and show my answer those who didn't accept my results in bicycletouring, although at that time I cycled all of the paved ascents of the PyrenĂ©es and cycled more than 150 times above 2000m. By the end of the year 2011 I ascended up to ALL of te paved ascents of the Alps too by my touringbike, as a cyclist from a ex-socialist country. 2368 km + 42996 m The next â€žhuntingâ€ť for roads going above 2000 m: BicycleTOURing in the PyrenĂ©es II. After previous years when I cycled in the Alps, in the year 2010 I returned to the PyrĂ©nĂ©es to finish and close â€žour affairâ€ť: my goal was collect by my bicycle all of the remaining paved roads going above 2000m, that I hadnâ€™t visited before. As â€žwarming upâ€ť I managed to cycle up to Mont Ventoux on the 4 ascents of it inside a day (6126 m heightdifference) from my camping and back to there) and with this achievement I reached the next â€“ Galerien - level of the Club des CinglĂ©s du Mont Ventoux. With that day I entered the best 10% of the Club with ca. 3600 members at that time. Carrying on with my tour I started my PyrenĂ©es crossing from the shore of the Canal du Midi and ascended such climbs, like Cirque Troumouse (2109 m), Boi TaĂĽll (2038 m), Andorra-Arcalis (2225 m), Vallter (2150 m) and such hardly known ones, like one of the most beautiful: Presa Lâ€™lauset (2193 m) the valley of Puigmal (2077 m) and Lac Bouillouses (2017 m), etc. That was a great feeling to see live and experience, live through by wonderful or legendary places the Tour de France experience, see the fans, the caravane and the racers. I was surprise by the beauty of Guzet Neige (Tour de France mountain stage finish a few years earlier), the Tour de France experience by the Col de Peyresourde, and the hard and nice Col dâ€™Azet and the steep Pla dâ€™Adet. After entering Spain, leaving Sallent de Gallego behind me, I was amazed by the landscape for ca. 150kms wide: wonderful! By the Ordesa canyon huge rocks, rockwalls, mountains towers to the sky, their shapes are specific and nice flower-fields colours the bare mountainside. Andorra was a gift-day for me as I felt the same in 2007: On a beautiful landscape and by ideal weather I enjoyed cycling 3 times above 2000m; one of them was the legendary mountain stage finish of 2007, Arcalis, where Jan Ullrich won the stage. After collecting all of the paved pyrenean roads going above 2000 m I finished my tour by the camping of Barcelona, where I ended the tour with paddling in the sea and feeling happyness and the success, while enjoyed the rise of airplanes above my head. In the Alps only 38-39 ascents finishing above 2000 meters remained to be visited to have all them (that time). Till the end I finished the challenge ! Bicycletour in the Alps VII. During this tour I visited roads going above 2000m: partly such climbs that I have never climbed (one of them was the last paved col of my pass-collection above 2000m in the Alps. ), and on the other part I had 2 unforgettable events. On my 2nd day I had a pleasant half-day-long tour with my italian friend, Mauro Repetti up to Mottarone. From the 3rd to the 7th day I climbed 9 south-swiss paved ascents going above 2000m: memorable ones were the panoramaroad Alpe Galm (2231 m) and the Oberaarsee where I cycled between snow-walls, but the most beautiful was the Mannlichen (2229 m) just next to the Eiger â€“ MĂ¶nch â€“ Jungfrau trio. On a wonderful day that made me remember the Tour de France mountain stages, I was riding my bicycle from Morzine (France) to Albertville and climbed Col de Ramaz, the legendary Colombiere and Aravis passes. I managed to broke my record and have a new one with 3151 m heightdifference. Not much after it I was amazed by the Col de lâ€™Iseran (2770 m) again (after 2004) enjoying the beautiful sunlights after a shower. I participated in one of the hardest and famous alpine bicyclemarathon, La Marmotte which crosses Col du Glandon 81924 m), Col du Telegraphe (1570 m), Col du Galibier (2645 m) and the finish is situated at the 1860 m high Alpe Dâ€™Huez, one of the most legendary finish of the Tour de France. The official distance and heightdifference is 174 km + 4900m, but with a little bit of extra climbsI got a new heightdifference record with 5316 m. After a rainy day when I had been cycling towards / to Austria, I was riding my bicycle on a test tour along the route of the hardest classical bicyclemarathon of the Alps, the Ă–tztaler radmarathon (228 km + 5200 m). The marathon has 4 climbs: the KĂĽhtai (2017 m), Brennerpass (1374 m), Jaufenpass (2099 m) in Italy and the last and hardest one, after 175 kms, the Timmelsjoch / Passo Rombo (2509 m). Without marathon-feeling I tried to lift my spirit and managed to cycle the roundtrip without any problem. 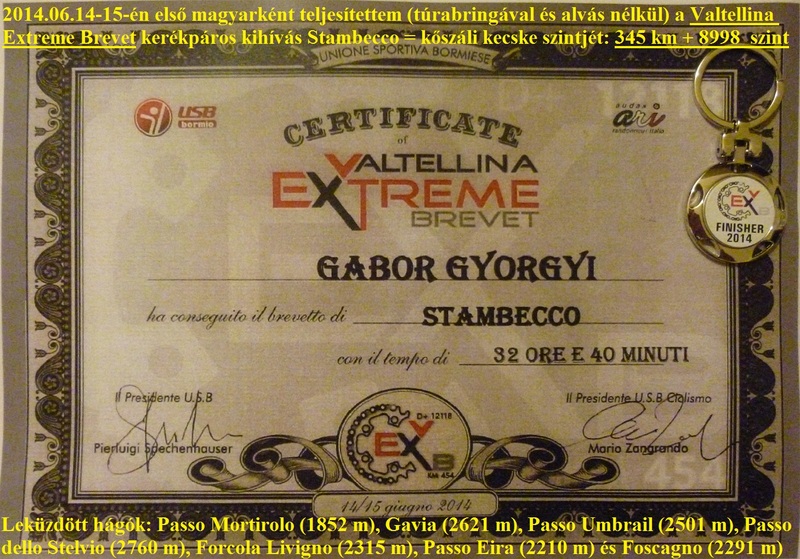 After this success my goal is to did it with live, true circumstances with participation of the Ă–tztaler radmarathon in 2010: cycling the truely hardest classic bicyclemarathon of the Alps. As its slogan says: I have a dream. After the lot of work I had for few months by my working place and have worked for 10 years I felt that I deserved a bicycletour in spring at a warm zone of the Earth in or not far from Europe. Because the airplane ticket to tenerife wasnâ€™t much more expensice than a ticket to South Spain, I didnâ€™t felt worry fly so far (far from me). I bicycled there 2 wonderful weeks, along cactuses, enjoying the beauty of volcanos, oceanic panorama, views and sometimes looking downwards to the clouds from the heightlevel of 1800-2400m. I bicycled in tropical forest in La Palma, through lava field in both of the islands and often cycled into and out of clouds. I could hardly realize, comprehend so much beauty and the wonder of bicycling above the clouds. Thatâ€™s what we could hardly realize during our bicycling experiences in Europe. Of course the long and serious climbs attracted me to visit the islands, so I ascended Roque de los Muchachos (2426 m) from both directions and from three directions I cycled up to the Teide plateau (above 2100 m), in Tenerife â€“ 2 of them riding my bike with 24 kgs panniers on it. My bicycletour in 2008 again went back to the Alps: I had to return to a few places; I wanted to conquer some wonderful and / or serious climbs. After flying to there, I started my tour from Nice. The 3rd day was the most waited day of the tour: cycle 3 times up to the 1909 m high Mont Ventoux (4500m heightdifference) so to be the 1st hungarian member of the Club des Cingles du Mont Ventoux. On a perfect day riding my touringbike I managed to cycle 3 times up to the legendary Mont Ventoux from 3 different sides so that when I reached the summit by sunset I shouted my happyness into the air. 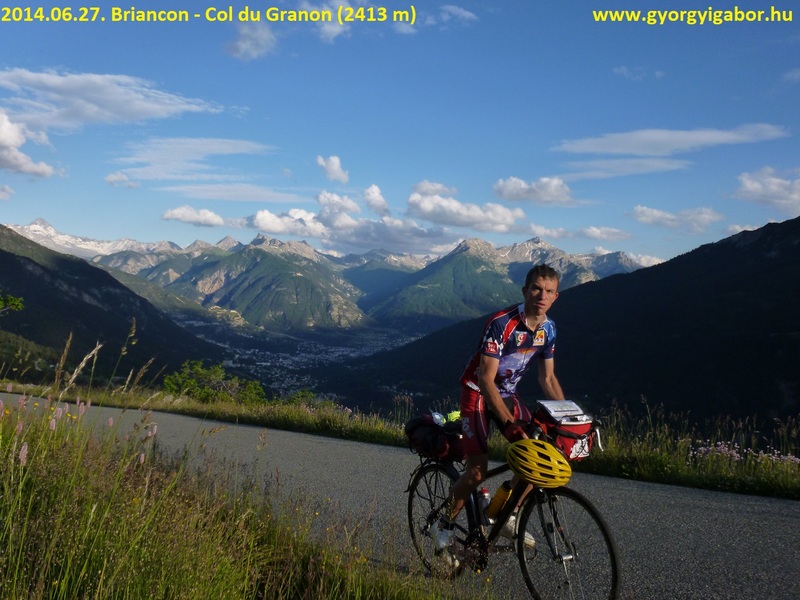 After bicycling 2 local tours from Nice I had another challenge: on another great day riding my touringbike with 26kg panniers on it I was bicycling the most paved, bicycleable heightdifference in Europe: from sealevel to the 2802 m high Cime de la Bonette. (I have 19 min long videofilm about it) After another beautys, cols, like Col du Vars, Colle Agnello / Agnel, etc, the last great attraction was the Trittico (triple) Mortirolo with an italian friend of mine, Mauro Repetti from Tirano. We cycled the legendary Passo Mortirolo (1852 m) from each of the tree ascents (3600m heightdiff.). Now I say again Thankk you for mauro for that unforgettable day! Instead of relaxing and having rest, on the following day I ascended from Tirano (440 m) up to the Passo dello Stelvio (2760 m), again riding my touringbike with panniers on it. That was the last serious day of the tour, after it light days to the â€žfinishâ€ť, Landeck (Austria). After cycling up to almost all of the alpine paved passes of the Alps, in 2007 I and the tourmate of mine, Peter RiskĂł planned cycling in the Pyrenees. On the web I found the Tourist version of the RAID PYRENEEN, which was just made for us. The tourist version of the Raid Pyreneen is officially 790 kms + ca. 18000m heightdifference with 28 cols and we had 10 days for it. Before starting the 10 day long Tourist version of the RAID Pyreneen, we spent 4-5 days in the Pyrenees, in Andorra and visited such climbs as Port Cabus (2300 m), Port d'Envalira (2408 m) and enjoyed the Tour de France feeling. We had fantastic memories at Cirque Gavernie and then in the valley of Cirque Troumouse, where we saw waterfals, and small clouds coming up from the bottom of the valley not much before sunset - in beautiful lights. I enjoyed very much the legendary climbs of the Pyrenees as the hard (11% for 4 kms) Col du Marie Blanque, Col d'Aubisque, Col du Tourmalet... THis col is betwen the 5 most legendary climbs of the Tour, so we waited it very much, and we had fortune with the weather. With a little bit clouds around us the surroundings of the col was so fantastic which is very rare and made the Col du Tourmalet one of the most memorable col for me through my 15 years bicycling. In the Pyrenees we also experienced froggy mornings and evenings, but the weather was very good. The second half of the Raid went through lower mountains, but we had Col de Mente and Portet d'Aspet, Port de Pailheres as legends. IT was a good feeling, that we cycled where famous bicycleracers climbed few decades before us. Through the 10 days we could keep our plan, so we had left one day for a local tour on the 9th day. We visited calm mountain roads and reached the spain border again. Our last day was memorable again with the beautiful Col de Garavel, the mediterranean Col du Palomere with the sight for the sea and the last 20kms along the sea through a few tourist village. We succeeded to cycle through the Pyrenees as first hungarian bicycletourers. Before the long bicycletour in the summer, my second trainingtour happened in Austria. I and a friend of mine spend three days there and I cycled up to Weisssee (+Hochwurtenspeicher: 2417 m), GRosssee (2380 m) and my most memorable one, the Grosse Oscheniksee (2394 m). Eacg of them has 12-13% steep sections, but the first is generally variable, as it has after 4-5 kms short flat or down sections. ON my second day morning I climbed GRosssee in a nice, friendly valley with leafy and fir trees, grass, flowers, and fantastic panorama. In the afternoon it was hard to reach Grosse Oscheniksee before sunset, but I tried it. That road was superb and very hard, but enjoyable. 4-5 kms with 13-15% steepness. The last 3-4 kms twisted on a mountainside without trees but with panorama down to the valley. The steepness was again 12-14%. As I arrived the top I felt it was one of my most memorable climb and day with these two challenges. On each of the three climbs cars are prohibbited, so there were only two: the nature and me (and 1st day my touring-mate). Bicycle tour in the Alps IV. After the last 2 years of my alpine bicycletours, in 2006 I went back to the Alps with the aim that after my tour maybe I would be the first hungarian people who bicycled up to all (74-75) of the asphalted alpine passes above 2000m. I love the Alps, with the fresh air, nature, plants, climbs, views, so it was equal for me, where to bicycle. AFter 6 years of alone bicycling, this year I had two guys with me: BalĂˇzs GaĂˇl for (unfortunately only ) 2+1 days, and Peter RiskĂł for the whole tour. In Italy and France we had nice, warm, sunny days with cycling a few hard cols, passes, like the 2612m high Passo Nivolet (I'm sure, it's between the 3 best / most beautiful passes, where I had been), or the almost unknown Passo del Preit (2083 m), onto we bicycled in stormy weather with thunderstorms. The Col des Gondrans (2347 m)was also very nice next to Briancon, I can suggest to visit it, although the last 3-4 kms of the road was closed because falling rocks 50m long on the road. After Col du Lautaret, Alpe d'Huez, Col du Sabot, we arrived to Chamonix on a nice day, when at last we could see the snowfields of the Mont Blanc before sunset. In SDwitzerland because of the weather we postponed passes for the next days, or climbed 1-2 of them partly in rain and arrived to the top in 4-8 degrees Celsius. The Sustenpass was the worst. After the also rainy and cold Oberalppass we bicycled southwards to Italy and to the warmer weather. The Passo Spluga (2117 m) was also a very beautiful pass, with a lot of hairpins, views and superb hairpin-row on a almost vertical wall, with short straight sections. Because the times went by too fast in that evening I decided to climb the famous Mortirolo (and the 2100m high Passo Val Bighera) in dark, in the night. It was wonderful: in a calm, dark forst in a warm air. I enjoyed very much the nature, air, and the views, because it was light, because I had fortune with the full Moon. I enjoyed the feeling so much, that I spent much time above. Our last pass was the Passo Goletto di Crocette (2070 m), onto we had 8-10% steep kilometers in or after raining for 2-3 hours. In September I climbed the missing 4 cols, passes. In the spring of 2006 I aimed to finish to succeed the Granfondo Campagnolo (204 km + 4447 m), the hardest bicyclemarathon in Italy in 2006, based on this link Before the Granfondo I and two friends of mine spent 3 days in the Dolomites, with those tours I bicycled onto 6 passes above 2000m there. The most wondeful climb was the very hard Tre Cime di Lavaredo (2350 m) from the Lake Misurina, with a beautiful panorama. An another memorable pass was the Staller Sattel (2052 m) on the austrian border. It's last 5 kms was only half road wide, and the traffic could go up and down for each half-half hours. This section is very nice with panorama, calmness, forest, flowers, blue lake down and snow on the mountains. The Giau pass was a hard one, but "only averagely nice". 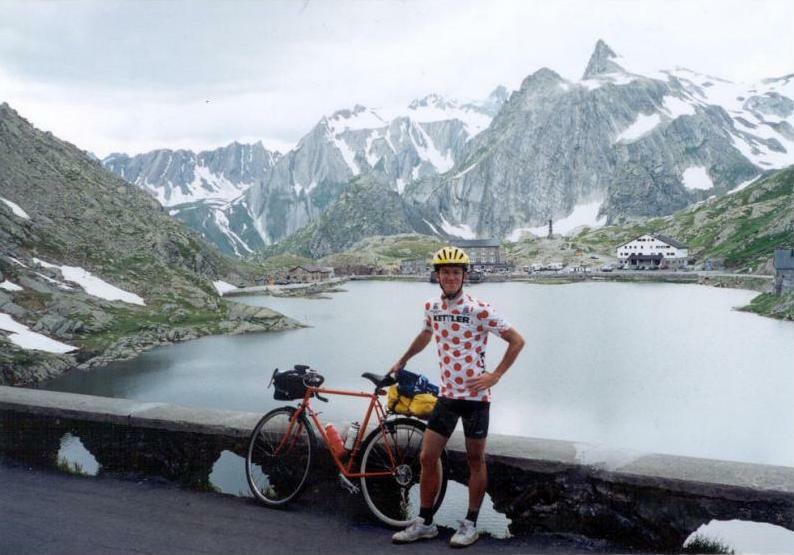 In 2005 I made a bicycletour in the Alps similar to the tour in 2004. While that year I climbed the famous cols of the Tour de France, this year I choose the passes of the Giro d'Italia and the Tour Suisse, but besides them I succeeded in finishing a hard bikemarathon, the Fausto Coppi granfondo! The well known passes of my tour were: Colle Lombarda, Cime de la Bonette, Colle Fauneria / Pantani, Col de Vars, Col de Granon, Sestriere, Colle Finestre, Nufenenpass (CH), Grimselpass, Furkapass, Passo San Gottardo, Julierpass, Berninapass, Passo Gavia, Timmelsjoch and at the end the Gletscherstrasse up to the height of 2829 m.
Until the end of that bicycletour I collected 50-51 passes above 2000 m in the Alps. This year I succeeded in cycle through the French Alps, which had been one of my Great dream, plan for year. For years I felt that a tour in France can have more problems than in the nearer countries, but with the experiences of my tour in 2003 (along the Adria and to Montenegro), this year I felt enough encourage to cycle up to the famous french cols. I had read a lot of travelogues (Trento Bike Pages, Velofahren.de, biketrip.org, etcâ€¦) and I tried to think about every problems which can occur through a French Alps tour: degrees around zero on the high cols, the busy campings, the effects of the Tour de France, and maybe some mechanical problems and the lot of train-changes. In the first two days and in the last two days I had some problems, adventures, but just between the high mountains of the French Alps everything happened well. There every night I could send the sms to home: Everything went as I planned, I climbed thisâ€¦ and that colsâ€¦" I climbed almost all of the passes / cols, that I planned for the whole tour, this means 21 serious ascents, 13 of them are above the height of 2000 m. The most famous cols where I cycled are: La Bonette (2802 m), Col du Galibier (2645 m) , Col dâ€™Izoard (2361m) , Alpe d'Huez (1860m), Col de Iseran (2770m), etc. Because I like both the blue-green sea and the mountains, this (2003) summer I chose a tour, when I can enjoy both. 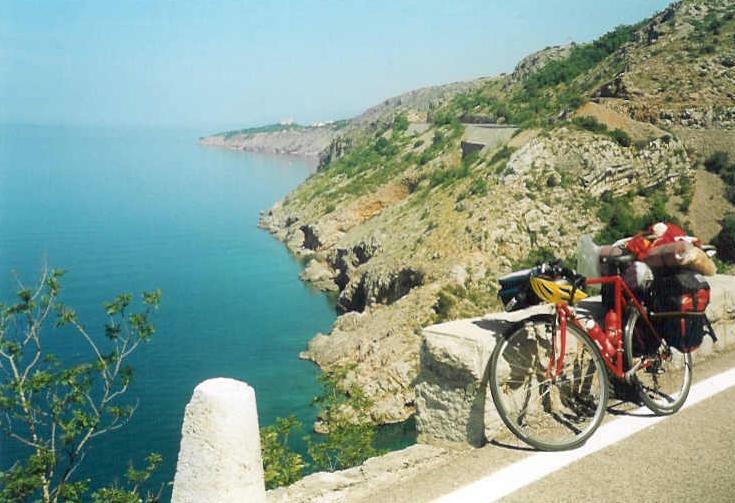 From Ljubljana - with visiting the islands of Brac and Korcula - I cycled to Montenegro along the Adria through towns shown on the lists of UNESCO World Heritages, like Sibenik, Trogir, Split, Dubrovnik. Above Makarska I biked up to the height of 1228m, on the Sveti Jure, on a forestry road, that contains the death-bend. Arriving to this hairpin the cyclist can see that after the bend in there is a big abyss. Next to the edge of the road the rocks go down uprightly. Montenegro is the casket of Europe, what show us for example the Jaz beach, Budva town, the Moraca-canyon, the National park of Biogradsko and the untouched Rijeka Crnojevica. From Dubrovnik I travelled by ship and by bike bach to Ljubljana, where from I used train to come home. 2002, march: After winning the article-writing competition of the Bringa (Bike) magazine I could spent nearly two week in Greece in spring with the hungarian MTB-squad. While they made trainings, I made nice cycletours ind the 17-22 degree warm weather and took good photos and videofilms. It was strange, but good to cycle already in march in every day almost 150 kms. I enjoyed it very much. I visited one of the most beautiful towns in Greece: Nafplion, then Argos, I biked up to the height of 1400m, but I also managed to cycle to Athens.